We are a team of people who live and breathe Barcelona. We created Barcelona Modernisme, Barcelona’s Modernisme Route, to share our passion for this city. Barcelona is built through an architectural landscape full of unique landmarks. These monuments give that irresistible air, making the city a favorite of travelers not only from Europe, but from all over the world. The magnetism of Barcelona resides, to a great extent, in its impressive modernist architecture, the hallmark of the capital since the 19th century. Yes, we get it, there’s a ton of Barcelona tour apps, but none like this one. These tours were all handpicked by us and written by professional tour guides who highlight all the stories and facts about the city that even most local residents wouldn’t know. Our authors carefully design each tour to bring you the stories behind well-known landmarks like the Sagrada Familia or a hidden gem. We hope that our tours will help you see Barcelona in a new light, learn a thing or two, and come to love the city as we do. 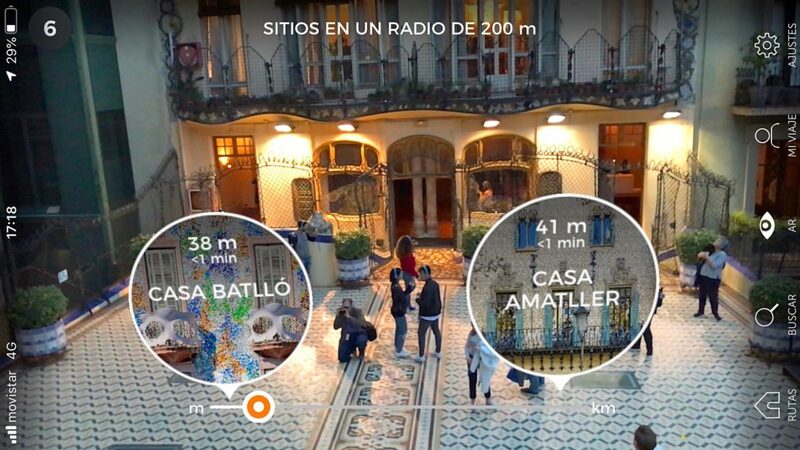 The app will help to discover Barcelona’s Modernisme. At your own pace. 70+ handpicked locations beautifully illustrated. Discover sights near you with the Augmented Reality tool! Tickets, timetables, schedules, commuting information to make easy your visit. Feel like an local resident with our useful tips. Do not miss a must-see spot or hidden gem near a landmark you are visiting! Designed so you can follow along at your own pace. You can create your own route as well. The app will optimize it in real time. Requires no Wi-Fi or cellular connection. Maps, images and text work in offline mode (to get info about best routes, distances and times would need Internet connection, though). Our Barcelona’s Modernisme Route includes up to seventy of these representative buildings in our itinerary. On the walk through Barcelona, it is essential to make a stop at the Casa Batlló, one of the works that represents the maturity of Gaudí, and results in a unique combination of light and color. The same happens with La Pedrera, which more than a building, is a gigantic wave of rock with an organic flair. Considered a stony poem, it is easily recognizable by its indomitable, sinuous and open aspect. As representative as these works is the Palau Güell. This unusual urban palace is located in the Raval district, standing out for its groundbreaking conception of space, light and its rich applied arts. You will not find sponsored content here. All the places have been personally visited by us. We’re always on the lookout for new tour ideas and authors who share our fascination with Barcelona. Give us a shout at cityguides@fluido.es.